Hollar was born into minor Protestant nobility in what is now the Czech Republic but was then called Bohemia. His peripatetic career is reflected by his name: in his native city of Prague he was Václav; in Germany he was Wenzel; in England, where he spent most of his working life, he was Wenceslaus. Hollar left Prague for Germany at the age of 20, probably because of the repression of Protestantism; he remained in Stuttgart for a couple of years before spending time in Strasbourg then Frankfurt, where he worked as a topographical draughtsman and etcher in the workshop of Matthäus Merian the Elder. Merian’s large, flourishing workshop was at the centre of German print publishing in this period. The year 1636 was a major crossroads in Hollar’s career: while in Cologne he met the great English collector Thomas Howard, Earl of Arundel, who was on a diplomatic mission from King Charles I. Arundel invited Hollar to accompany him on the mission as his official draughtsman and to record the journey, noting in a letter home that ‘I haue one Hollarse wth me whoe drawes and eches Printes in stronge water quickely, and with a pretty spirite’. At the end of that year Hollar arrived in London under the protection of Lord Arundel, primarily employed to copy works from his princely art collection and then transcribe these into etchings. The collection included fine old master drawings, the publication of which gave a wide audience its first sight of the art of such masters as Leonardo da Vinci. But much of what Hollar etched and published at this time – such as the city views and landscapes for which he is famous, not to mention his costume pieces of fashionably dressed London ladies – were unconnected to Arundel’s patronage. Indeed, when Hollar came to England the technique of etching was still largely unknown. Engraving was the dominant printmaking technique and there were no native practitioners of etching. Thus the situation in which Hollar found himself was advantageous, for it enabled him to monopolise the field, becoming the preeminent exponent of etching in Stuart Britain. During the upheavals of the English Civil War, Hollar, whose sympathies were royalist, made his way to Antwerp in 1644 where he spent eight years in exile. Here he produced an abundance of etchings, many of them worked up from the stock of drawings he had carried with him from London. 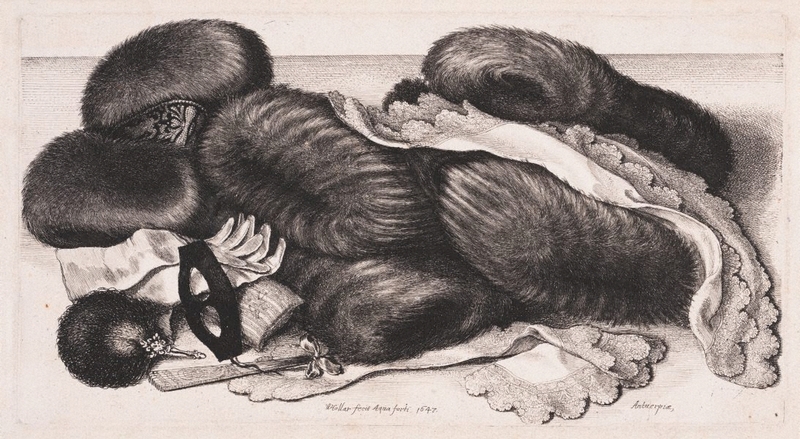 But by far the most original and unexpected creations of the Antwerp years are his six etchings of fur muffs (there are an additional two plates which complete the set but they were begun in London). Etched with incomparable precision and finesse, the Gallery’s print – the largest, most sumptuous (and undeniably sensual) of the series – depicts five muffs together with two kerchiefs with lace borders, a pair of gloves, a feather whisk, a mask, a pincushion and a folded fan. The very idea of presenting such articles as the subject of a still-life arrangement was entirely without precedent in the history of European printmaking. Signed and dated, l.c., [incised] "WHollar fecit Aqua forti 1647". Peter Raissis, Look , 'Early European works on paper', pg.20-23, Sydney, Aug 2014, illus p 23. Prints & drawings Europe 1500-1900 , Sydney, 2014, p 58, col illus p 59.